The legislation described above in the Labour chapter would make sweeping improvements to Mexico’s labour laws and practices. It would give all Mexican workers meaningful free collective bargaining rights and the right to belong to labour organizations truly of their own and which would negotiate transparent collective bargaining agreements subject to their ratification. These anticipated improvements would end the prevalent ‘yellow’ unionism in Mexico in which fake unions legally exist in workplaces but do the bidding of their employers via protection contracts imposed on the workers they illegitimately claim to represent. No new labour legislation has been passed into law as of January 1, 2019 in Mexico let alone legislation making such sweeping, positive changes. Worse still, there are no indications whatsoever that Mexico’s new, ostensibly leftist government has any plans to enact such new legislation at any time in the foreseeable future. The implications of this are quite revealing and far reaching. That this has not occurred nor is about to occur anytime soon is in fact wholly in line with the entirety of the provisions set out in NAFTA 2.0’s Labour chapter. This is readily apparent precisely because the Labour chapter is effectively meaningless and in practice represents a continuation of what was in the original NAFTA which came into force at the beginning of 1994. This destroys Canadian Prime Minister Justin Trudeau’s facile claim that NAFTA 2.0 has some of the strongest labour provisions of any trade agreement Canada has ever signed. The 1994 NAFTA had both labour and environmental side agreements. These agreements were mere window dressing. They only committed the parties to the agreement to live up to the requirements of their respective labour laws and they failed to do that. 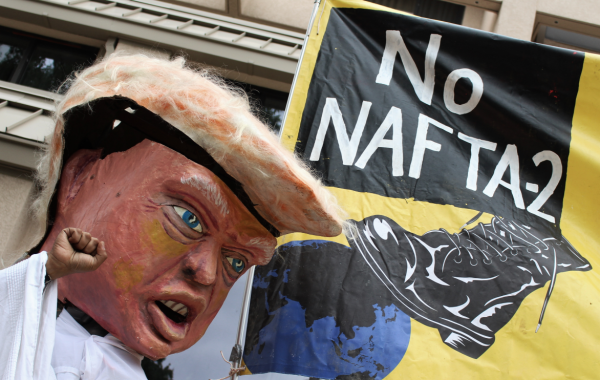 Those, like members of the San Antonio, Texas based Coalition for Justice in the Maquiladoras, who filed complaints under these NAFTA side agreements learned that filing a complaint was a worthless exercise in futility. The same can be expected with respect to the provisions of the Labour chapter in NAFTA 2.0. This is the case because the provisions set out in it are effectively no more than guidelines. No mechanism has been put in place for ongoing monitoring of the chapter’s guidelines and if these guidelines are violated there is no mechanism in place to meaningfully enforce them let alone swiftly enforce them. In effect, the provisions are again window dressing for a trade agreement which does what the same corporations whose interests were so well served by the 1994 NAFTA really want. It guarantees these corporations their highly desired access to a North American market subject to rules that generally serve them well. Accordingly, it is no wonder that NAFTA 2.0 has earned the praise of the Canadian Chamber of Commerce, according to the Minister of Foreign Affairs Chrystia Freeland. The provisions of the Labour chapter provide for the creation of a Labour Council. This misnamed Labour Council will be comprised of senior representatives of the three governments which are signatories to NAFTA 2.0. The council is formally tasked with ostensibly overseeing and administering the provisions of the Labour chapter. But it is telling indeed that this body given these tasks is only expected to meet every two years unless the Parties decide otherwise. Most significantly, the Labour chapter stipulates that all of its decisions and reports “shall be made by consensus.” This could not be more revealing. This effectively means that any dispute that might go before it can only be resolved by consensus among the parties including whichever party or government the dispute is made against. If there ever was a procedural formula for contentious issues to quietly go away and die on the vine this is it. As was the case with the 1994 NAFTA this assurance, in practical terms, of non-enforcement goes hand in hand with each party again only being expected to comply with and enforce its own labour laws. The prohibition of anything beyond that is explicit. The Labour chapter states in no uncertain terms, “Nothing in this Chapter shall be construed to empower a Party’s authorities to undertake labour law enforcement activities in the territory of another Party.” Consequently, if Mexico’s labour laws are not overhauled, as the Labour chapter anticipated they would be, and continue, as they have since 1994, to be widely unenforced thereby benefiting employers, nothing really can or will be done about it. Simply stated, this is a prescription for more of the same of what workers across North America have experienced since NAFTA went into effect in 1994. These pronounced shortcomings of NAFTA 2.0 cast a long, dark shadow over the auto provisions of the trade agreement which some have naively claimed comprise great progress for autoworkers. Canadian autoworkers should find it particularly hard to take NAFTA 2.0’s auto provisions seriously given that the Canadian government has also signed onto the Trans-Pacific Partnership (TPP) which contains a weak 45% automotive content provision. Indeed, no one has yet clarified either how this 45% automotive content provision can be reconciled with the higher automotive content provisions of NAFTA 2.0 or if they cannot be reconciled which of the two agreements provisions will take precedence. These are critically important questions that demand answers. To date they have been met with deafening silence by all concerned. More specifically, quite unlike the TPP, NAFTA 2.0 provides for a 75% North American content requirement as opposed to the 62.5% content requirement in the NAFTA of 1994 with North America including Mexico. Even if this increase is adhered to, it is quite modest. For example, had NAFTA 2.0 already been in place the new, higher North American content requirement would have not been an obstacle to GM’s current plans to close auto assembly plants (four in the USA and one in Canada) while not affecting any of their Mexican facilities. In the face of this hard reality Chrystia Freeland’s declaration that NAFTA 2.0 assures Canadian auto producers “preferential access to the U.S. market” must ring rather hollow for the workers at GM of Canada who are about to lose their jobs. Then there is the claim that by 2024 40% of cars and 45% of trucks must be sourced from high wage facilities in North America meaning facilities where workers are paid $16.00 (U.S.) an hour. Assuming this is done it is worth pointing out that $16.00 (U.S.) an hour will be worth substantially less by 2024 given certain increases in the cost of living over the next five years. Even then who is to say that Mexican auto employers will not be inclined to pay the nominal 2.5% tariffs on cars entering the U.S. rather than sharply increasing the wages of their workers. Furthermore, in the absence of the anticipated labour law changes necessary to truly empower Mexican workers and end yellow unionism how will Mexican auto and auto parts workers ever be able to strive for wages equivalent to $16.00 (U.S.) an hour? They simply will not be able to. A Better Deal for Who? Arguably this can be said to be a better deal for some, like American dairy producers, who are gaining substantially more access to Canadian markets and to pharmaceutical corporations who will reap more profits from the extension of drug patents. But it does nothing for workers. To the contrary, it perpetuates the trade regime which has so adversely affected workers in all three countries over the last 25 years. Bruce Allen is a former Vice-President of CAW Local 199 (now Unifor).